Once the sisters grew up and became teachers, they continued to mix music and words, creating lovely melodies with an infectious beat. Each day they serenaded their kindergarten class with the catchy song “Good Morning to All.” When Mildred and Patty changed the lyrics at a birthday party, they could hardly have imagined that their little tune would become one of the world’s most recognizable and beloved songs. 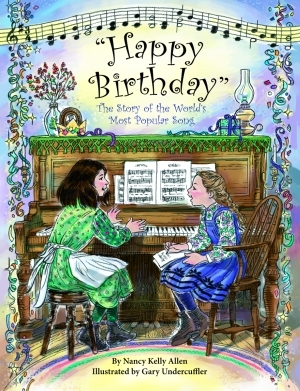 Complete with Gary Undercuffler’s detailed and colorful illustrations, this cheerful children’s book captures the history of the “Happy Birthday” song. Nancy Kelly Allen is the author of Pelican’s Daniel Boone: Trailblazer. As a former teacher and librarian, she enjoys being in an environment where she can conjure ideas for her next story. Allen earned master’s degrees in elementary education, from Morehead State University, and library science, from the University of Kentucky. She resides in Hazard, Kentucky. In addition to teaching art and design, Gary Undercuffler has received numerous awards for his art, including three Illustration of the Month awards and three Illustration of the Year awards from Highlights magazine. Undercuffler lives in Glenside, Pennsylvania. what a fun birthday gift this would make!